Your child is completely unique, so playing and dreaming in a playscape that reflects that wild, spirited imagination will take her creativity to the next level. PopUp Play taps into kids’ creative energy by encouraging them to design and personalize their own playscape. While the playscapes look like a haven for little ones, older kids and siblings will enjoy becoming mini-architects as they fashion the playscape of their dreams using a mix of multimedia magic. PopUp Play uses a free downloadable app for the design process (an Android version is coming in the near future), and the actual decorating is hands-on, tech-free time for more imaginative flourishes and design details. Kids can currently choose from a castle or a gingerbread house, and a rocket ship design will be taking off in early 2016. After picking their new playscape, it’s time to virtually play: kids can add design details such as windows and towers. As a finishing touch, kids get to create their own coat of arms and name their abode. No matter what design they choose, the rates ($99 for the playscape plus $10 for the shipping) stay the same. When their playscape arrives a few days later, more fun ensues. 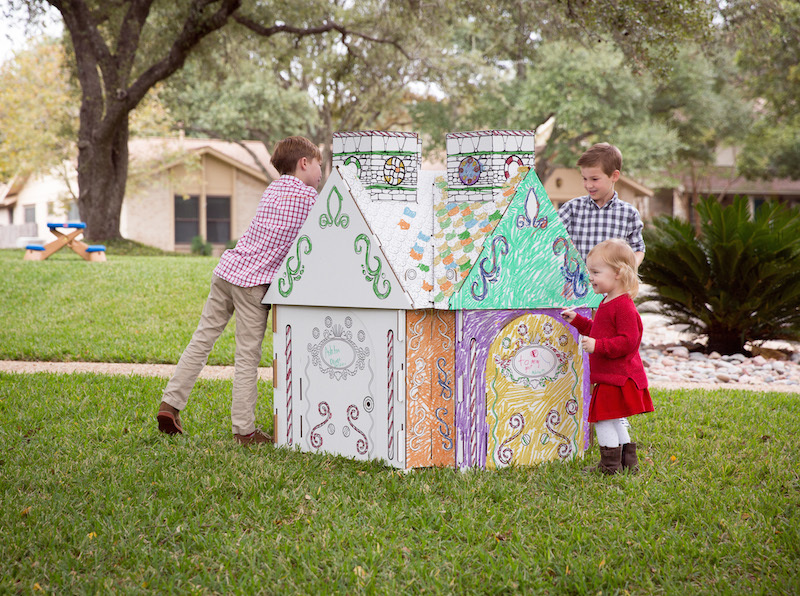 Children can decorate their castle or house in any color scheme using paints or crayons! PopUp Play designed the playscapes so that kids could put them together and feel even more empowered over “building” their own creation. If they (or you!) need a little help, PopUp Play made a helpful assembly video. The completed structures are around 4 feet by 4 feet and up to about 4 1/2 feet tall (depending on design details) and are made in Texas from non-toxic, recyclable fiberboard. While we are sure these playscapes will be in constant use, they also fold up easily for storage or transport. We love experiential gifts, and we think PopUp Play incorporates the best of both worlds — kids get to use their noggins to design the play area of their dreams and then have a hand in decorating and playing in it. Your child is completely unique, so playing and dreaming in a playscape that reflects that wild, spirited imagination will take her creativity to the next level. PopUp Play taps into kids' creative energy by encouraging them to design and personalize their own playscape. While the playscapes look like a haven�for little ones, older kids and siblings will enjoy becoming mini-architects as they fashion the playscape of their dreams using a mix of multimedia magic.�PopUp Play uses a free downloadable app for the design process (an Android version is coming in the near future), and the actual decorating is hands-on, tech-free time for more imaginative flourishes and design details.